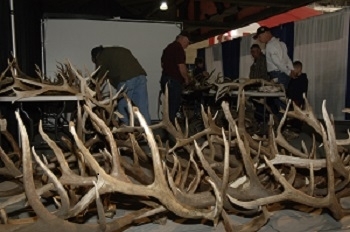 Antlers and wildlife assets to be sold at Arizona’s Outdoor Expo! PHOENIX — The Arizona Game and Fish Department’s annual sale of wildlife assets will take place April 2-3 at the 2016 Outdoor Expo at the Ben Avery Shooting Facility, a change in venue from the International Sportsmen’s Expo (ISE) set for March 10-13 at WestWorld of Scottsdale. Missouri’s share the harvest gives 1/4 million pounds of venison to feed the hungry! Thank you to 4,530 deer hunters, 100+ meat processors, and numerous sponsors who helped Share the Harvest! JEFFERSON CITY, Mo. — More than 4,500 deer hunters donated more than a quarter-million pounds of venison (228,306 pounds) from last season’s deer harvest to the state’s Share the Harvest program. The donated deer meat will help feed hungry Missourians all around the state. Chronic Wasting Disease found in Arkansas! The Virginia deer harvests reflected an increase from last year Wildlife biologists with the Virginia Department of Game and Inland Fisheries (VDGIF) have compiled the preliminary figures for the 2015-16 fall/winter hunting season. During the 2015-16 deer hunting season, hunters killed 209,197 deer in Virginia. This total included 103,310 antlered bucks, 15,000 button bucks, and 90,887 does (43%). Wisconsin’s Deer Management Assistance Program deadline almost here! It’s not too late to sign up for DMAP in 2016! March 1 is the deadline for properties of 160 acres or more.